RSVP Links and Regrets Links are two of the special links you can compose in an email to send to a target group. These are specifically designed to help you know who will and who will not be attending a specific meeting. Both of these links work similarly to a Vote Link , in that they are one-click, one-use links. The difference is that these links will not only enroll the person as a member of the org (if they are not already enrolled); they will also flag them as `Attending` or as `Regrets` for a specific Meeting. If the person is already a member of the org, it only sets the appropriate flag for the meeting. 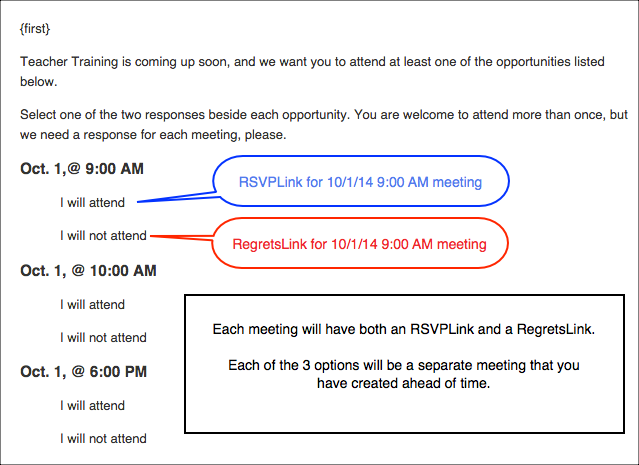 Both RSVP and Regrets Links set a commitment flag on a specific meeting. Attending indicates a person’s intent to attend a specific meeting. They are not recorded as having attended until after you record attendance for the meeting. When they are marked present, the flag is set to Attended. Regrets indicates that a person will not be able to attend that meeting. Uncommitted indicates the person has not responded yet. These flags are in the Commitment column on the Meeting. You see this column when you click Show Registered . If you want to know that everyone has responded to your email, use both an RSVP Link (for those who will attend) and a Regrets Link (for those who cannot attend). Those with a Commitment flag of Uncommitted are those those have not yet replied to your email. Organization: Have an active Organization into which the people will be enrolled. Registration Type: Set to Join Org . Meeting: Create a Meeting and make a note of the Meeting ID#. The Meeting ID# is the number at the end of the URL when you are on the meeting page. Selecting the right audience is vital to the success of your email effort. So, be very careful when creating your search, in order to ensure that you have the correct group to receive your Vote Link. If you are using both an RSVP and a Regrets link, you must think about whether or not you want to send a confirmation email. This confirmation is the one on the Message tab of the organization. If you select “Yes, Send Confirmation” for both links, everyone will receive the same confirmation. So, your confirmation must have messages addressed to both groups of people. Instead of doing that, I recommend sending the confirmation only to those who are coming (the RSVP link), but not to those who are not coming (the Regrets link). See the prerequisites above. Then proceed as outlined below. Select RSVP Link from the Type drop down menu. Then enter the Meeting ID# in the OrgID/MeetingID# field. Remember, you must create the meeting in advance in order to know the ID #. The meeting ID is the number at the end of the URL when you are viewing the meeting page. Enter the Message you want to display on the screen after they click the link. This is not the same as the email confirmation. Select either ”Yes, send confirmation” or “No, do not send confirmation” from the Confirmation drop down. If you are including more than one RSVP Link in this email repeat step 2-3 above for each link. Send a test email by clicking Test (Send To Yourself) . Complete the same Requirements as for the RSVP Link at the top of this article. Then proceed as outlined below. Complete Steps 1 and 2 as above. Select Regrets Link from the Type drop down menu. Remember, these will be future meetings. So, check Show Future Meetings on the Meetings page. Then, on the Meeting itself, be sure to select the radio button Show Registered , so you can see the Attending and Regrets flags. You can create a Saved Draft to use each time your Committee or group of leaders is going to meet in order to find out who plans to attend. This uses a special code and the responses are flagged in the next upcoming meeting for that org. You must create the future meetings in order for this to work, and the Registration Type on the Registration tab must be set to Join Org. Also, you will use the Org ID#, not the meeting ID#. Create a draft and enter some text for the recipient to click, such as CLICK HERE TO RESPOND YES and CLICK HERE FOR REGRETS. Follow the same instructions as above for both the RSVP Link (the yes responses) and the Regrets Link (the no responses) with the exception of the meeting ID. For both the RSVP and the Regrets link you will enter the Org ID , a period , then the word next . In the example 80942 is the Org ID, not a meeting ID. Enter the Message and answer Yes or No re a confirmation. You do not need a Sub-Group, as this does not create one. Be sure to follow these steps for both the RSVP and Regrets link if you want to capture both responses. Complete the email and press Save as Draft . When you are ready to send it, go to the org, and select Email Individuals, then select your saved draft. For each link, if you use the orgID# and .next , you will not have to change anything in the links themselves when you get ready to send the email. That makes it very quick to send out an email before each meeting, for your group to respond one way or another, and to have those responses set the Commitment on the Meeting itself, instead of putting them in a small group in the organization. Remember, to create the email completely and Save as Draft . Then go to your target group to send it each time. You have a series of meetings that are all basically the same, and you want people to attend at least one meeting. You also want to know which meeting they will attend and which meetings they will not attend. You can create multiple future meetings, either for the same date at different times, or on different dates and times. You then use those different Meeting ID#s in the appropriate field when creating the links. You cannot create multiple meetings on the same date and same time. If you include both an RSVPLink and a RegretsLink for each meeting, you will know exactly who plans to attend each meeting and who will not.